If you don’t have peaches, use plums, apples, pears or a mixture of frozen blueberries and cherries instead. If you want to make this more refreshing on a hot summer afternoon, add a few handfuls of ice cubes to the blender and blend again. I like to use this smoothie as a late afternoon pick-me-up. 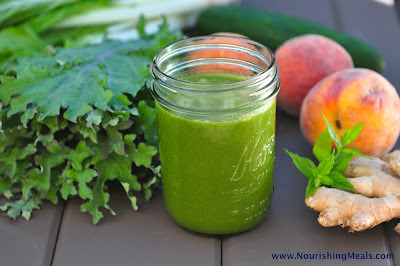 Neither Tom or I really handle any caffeine, so green smoothies are our natural energizing drink! Add a squeeze of lime to each serving if desired. Place all ingredients into a high-powered blender and blend until smooth. Add more water for a thinner smoothie. If it is too bitter, add another piece of fruit or liquid stevia to taste.